The EMP-7605 is a 2.4/5GHz 11n mPCI. It supports 2T2R MIMO architecture with fully forward compatible with IEEE802.11n. EMP-7605 supports 150Mbps and 300Mbps in 20MHz and 40MHz channel operations respectively and all IEEE 11b/g/n data rate. It provides 2 stream MIMO configurations, which is easy to implement to integrate into AP, Client Bridge and embedded system. The MAC supports the 802.11 wireless protocol and 802.11i security, receive and transmit frame filtering, error recovery and quality of service (QoS). 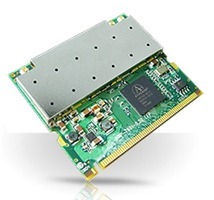 It uses Atheros 802.11n AR9220 single chip which combines the MAC, baseband processor and 2.4/5GHz Transceiver. The card is fully compliant with IEEE 802.11a & 11g standards and therefore offers the compatibility with existing 802.11g and 11b products.